Wide view of the Security Council. The United Nations General Assembly today elected Chad, Chile, Lithuania, Nigeria and Saudi Arabia to serve as non-permanent members on the Security Council for two-year terms beginning on 1 January 2014. The five countries obtained the required two-thirds majority of those Member States present and voting in the 193-member Assembly. Elected in one round of secret balloting, they will replace Azerbaijan, Guatemala, Morocco, Pakistan and Togo, whose terms will conclude at the end of this year. The five permanent Council members, which each wield the power of veto, are China, France, Russia, the United Kingdom and the United States. Non-permanent members Argentina, Australia, Luxembourg, the Republic of Korea and Rwanda will remain on the Council until the end of 2014. Under the UN Charter, the 15-member Council has primary responsibility for the maintenance of international peace and security, and all Member States are obligated to comply with its decisions. In addition, the Council takes the lead in determining the existence of a threat to the peace or act of aggression. It calls on the parties to a dispute to settle it by peaceful means and recommends methods of adjustment or terms of settlement. In some cases, it can resort to imposing sanctions or even authorize the use of force to maintain or restore international peace and security. 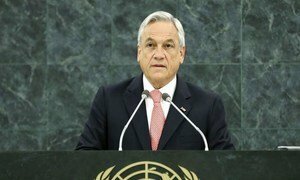 Chilean President Sebastián Piñera today called for profound reform of the United Nations Security Council, increasing its membership, abandoning the veto enjoyed by the five current permanent members, and instituting a super-majority rule for the adoption of major decisions.